Guy's and St Thomas' charity is the body responsible for endowing funds for services at Evelina London Children's Hospital. >> To contact the charity please visit their website. 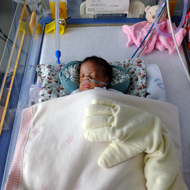 >> Find out more about how donations support Evelina London.